Located in south Pacific between Fiji & Samoa islands, Wallis and Futuna islands is an archipelago is a french overseas territory since 1961. Wallis and Futuna islands are located in the South Pacific Ocean, between Fiji and Samoa islands, at 4,600 km southwest of Honolulu (Hawai) and 4000 km northeast of Sydney (Australia). The archipelago includes three islands: Wallis, Futuna and Alofi. Wallis Island called Uvea by the Wallisians is nearly 100 sq km and the lagoon is protected by a coral reef. Terrain is volcanic origin with low hills (Mount Lulu 150 m / 500 ft). 20 islets called Motu are scattered in the lagoon and the reef. Maritime claims : exclusive economic zone is 200 nm and 12 nm for territorial sea. 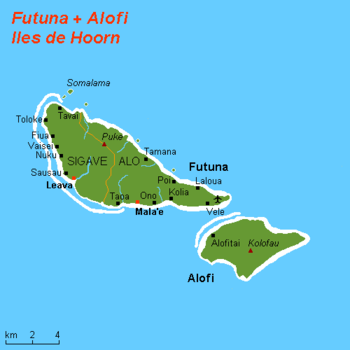 Futuna and Alofi (the latter is uninhabited) are located at 230 km in the western south of Wallis. ( 178° 5 ‘ West / 14° 18 ‘ South) Futuna has no coral reef nor lagoon, contrary to Alofi. The archipelago is mountainous (volcanic origin), and is located on the zone of contact between the plates Pacific and indo-Australian. Futuna is thus subjected to earthquakes, the last going back to March 1993. The relief is more important than in Wallis with hills culminating to 524 m (mount Puke in Futuna) and 417 m (mount Kolofau in Alofi). Lots of lakes (famous Lalolalo Lake hereafter ) are located in ancients volcanos. Tropical climate. hot weather (27°C / 81°F on average), a rainy season (November to April) with frequent heavy showers and stoms and a cool, dry season (May to October) It on average makes hot and wet in Wallis with 27°C, the hottest month is February with 86° F (30°C) and 77°F (25°C) for July. The annual thermal amplitude is low with only 1°C. The humidity is important (83 % on average) and annual rains are about 3000 mm and nearly 4 m for Futuna. However, there are sometimes periods of dryness. Archeological excavations in Wallis have uncovered sites dating back to 1400 BC. The Tongians arrived in the 15th century and took possession of the island after battles which have become legendary. Population coming from Asia (2000 before JC). On 16th August 1767 the English navigator, Samuel Wallis, discovered the island of Uvea which was christened Wallis. In the 19th century many ships called at Wallis to take on fresh supplies. The first Marist missionaries, among whom was Father Bataillon (Wallis island) and Father Chanel (Futuna island), arrived in 1837. On 5th April 1842, the authorities in Wallis requested French protection. During the Second World War a regiment of U. S. MARINES arrived in the archipelago in May 1942 to deny the island to the Japanese, followed by few Free French forces some months later. The Allies thus disposed of a strategic air base in the South Pacific. Since the archipelago measures only 270 sq Km, many inhabitants of Wallis and Futuna were, in the 1950s, and for economic and demographic reasons, attracted to the plantations and mines of New Caledonia and the New Hebriddes (rebaptised Vanuatu). There is therefore acommunity of Wallisians in Noumea and over all the Caledonian territory, made up of approximately 17,000 people. Wallis offers a variety of activities ranging from traditional ceremonies to modern water sports but the Tradition is important in the islands of the Pacific. Polynesian songs and dances are ever present in religious or traditional ceremonies as in the local beverage, kava (piper mehtysticum), made from roots. The effects are very relaxing and kava many medicinal properties. Festivities are organised at Christmas and the New Year, on 14th July and on 29th July, which date commemorates the statute of overseas territory. Each village organize each year festivities. Few months ago, sound engineer Roland Di Rosa created « Digital Sudio » to produce wallisian music. His latest release is a « best of » including Semata, Taulaga, Ofamahi and much more. Wallisian bands needed to go to New Caledonia to record songs before Roland decided to build a recording studio. Siapo Handpainted clothes known as Tapa or Gatu, made from the bark of a tree : Broussonetia papyrifera. It may be found in the markets. A Siapo made in Futuna. It is a huge Tapa, up to 35 meters long, which serve as traditional wedding presents. Mats, known as Fala, are made from the leaves of the Pandanus, and Parcos are used as clothing all over the Pacific. Wooden carvings and shells are also to be found. Walking, bicycle, horseback, motorbike and rented cars are the main means of transport, as well as the boat which goes round some of the smaller islands like the island of birds (Nukufotu) and Faioa, with its beaches of fine sand. Formed in ancient craters, Lake Lalolalo, Lake Lanutavake and others offer breathtaking viewpoints. Walking, bicycle, horseback, motorbike and rented cars are the main means of transport, as well as the boat which goes round some of the smaller islands like the island of birds (Nukufotu) and Faioa, with its beaches of fine sand. Cricket comes into fashion again. Discover coralian as well as volcanic islets spreaded all around the lagoon. Just a few minutes sailing from the main island, magnificent beaches are waiting you for your visit offering you finest white sand and chrystal blue waters. Simply equiped with fins, mask and tuba, beginners will enjoy swimming among crowds of multicolored fishes. Have your first scuba diving lessons with qualified instructors in chrystal clear waters at 28°C. Confirmed scuba divers as well will enjoy discovering submarine bottoms of the lagoon inside or outside the coral reef barrier. Rent a sail-board, a hobie-cat or a traditional canoe and just let yourself slide over the turquoise blue waters of the lagoon. Would you be tempted by game fishing ? call for Pierre or Vicko…they will sail and lead you to their secret spots where you will enjoy teasing the barracuda, tuna fish, carangue and other tropical fishes, and why not ? a mythic marlin may suddenly get hookerdat the end of your fishing rod ? … but you may also prefer to sneak around on the Pacific waters, observing and filming dolphins performing acrobatic figures around your ship. Located in Toloke village at the very North East end of Futuna Island, Somalama Park Hotel has been built right on the beach in a magnificent decor of volcanic hills. The restaurant is originally spread out in many little fale (traditional hut) under which you will savour the typical Futunian crayfish after which you appreciate a walk along Toloke beach wherefrom at evening you shall admire wonderful sunsets. An idyllic place where to rest and fully appreciate the Oceanian way of life. Located in Nuku village, Hotel Fiafia is close to Sigave bay and Leava village : commercial and administration center of the island. Police station and Post Office lay in the immediate surroundings.The restaurant of Fiafia hotel has been designed according to the rules of traditional architecture in a fale (traditional hute) style. The dining room is decorated with old navy and maritime equipments and objects, artefacts and a wide collection of shells. The cook will prepare you a wide range of delicious seafood combinations in a warmwelcomed atmosphere. From the hotel, a short walk will take you to the wharf where you will admire very old and typical small boats called « kumete » sailed by skillfull youngsters. Situated on the Northern part of Wallis Island, just a couple of minutes to the airport, the Albatros Hotel is set in a green flourished tropical garden. You will enjoy sunbathing along the swimming pool sipping a home made coktail or, maybe, you’ll prefer farnienting on the terrace of your bungalow. Monica and Jacques will take care of you in a very friendly manner. They know all the « highlights » of Wallis and will give you all the advices about sightseeing and excursions such as to visit the Birds Islet where thousands of birds may be observed. Albatros is an intimate hotel compound of four bungalows spread around a main building designed in a colonial style architecture. Located at Mata’Utu, capital city of Wallis Island,Hotel Lomipeau on the top of a cliff dominating the east coast of the Island, offer a dramatic and breathtaking view on the lagoon and the islets set in a turquoise blue sea. Sunrise as well as nightly skies at full moonlight are inforgetable and may be apprieceted from many points of viewving either from the panoramic restaurant, or the swimming pool or also from the terrace of your room. You will appreciate the outstanding french and native cuisine prepared by Paola who runs both the hotel and the kitchen as a chef ! Would you like enjoying white sandy beaches or swimming among tropical fishes in the coral sea ? within 10 minutes you’ll be sailed out there, Paola and Christian will organize this for you. Located right on the sea shore at Liku village facing the eastern range of islets set on the reef barrier, Hotel Moana Ho’ou is close to the king’s Palace and the cathedral. Moana Ho’ou is run by a typical polynesian oceanian family crew which offers a quality smiling and warm atmosphere and will contribute to make your holidays in Wallis a genuine dream. Just across the lagoon, the sandy beaches of Nukuhione and Nukuhifala islets will offer you unforgetable farniente in the middle of clear and pure esmerald waters. .Wallis and Futuna is an overseas community of France consisting of two small island groupings in Polynesia, near Fiji and Samoa. In December 2012, cyclone ....Island, Capital, Other Cities, Area (km²), Population. Wallis and Futuna, Mata-Utu · Leava, Vaitupu, Alele, Liku, Falaleu, Utufua, 142.42 ....Features map and brief descriptions of the geography, people, government, economy, communications, transportation, military and transnational issues.